Less than a year ago, when we moved into our new house, I made a wish. I walked my daughter to the hallway of our house and made a wish: I wished for this house to be warm, to be caring and to always see people lined around the kitchen table. I wanted this house to bring old and new friends together. I wanted this house to be filled with laughter, love, couscous and mint tea. I wanted this house to feed us. To feed people; and to feed our hearts. Our wishes came true. Our wishes come true every single day. And for that, we are thankful to be looked after and to have a warm shelter above our heads. Our kitchen brought old friends and new friends together around the table a couple of weeks ago, when celebrating Earth Day with some local bloggers. Blushing cheeks and awkward silence (especially me) quickly faded away with espresso beans stories and some crostinis. The picnic table was set. The sun was out. 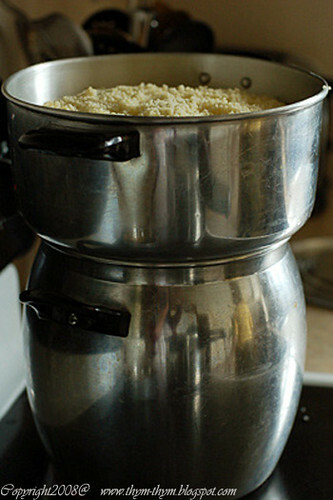 The couscoussier was steaming its last batch of couscous. Cameras were clicking (thanks again Christine for these lovely photos). Plastic wraps, banana leaves, and paper bags were unwrapped to reveal Uruguayan savory rolls, a refreshing mix of greens with fennel and orange segments, luscious mango and pastry cream tart, and an olive loaf. 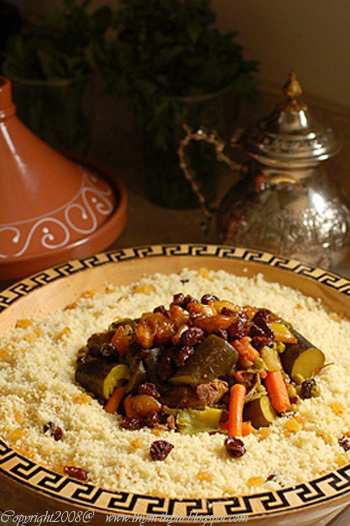 The couscous was mixed with steamed raisins and served in my mothers’ wooden “gassaa”, to which I added a lamb and vegetable broth made with green peas, zucchinis, carrots, and a dollop of sweet and deep, spicy and delicious glazed pearl onions. The couscous was good, spicy and sweet, although I would have liked the broth to be thicker. But a mysterious sous-chef turned off the burner without my knowledge and without my permission. These glazed pearl onions are just what you would expect from any caramelized onions and so much more. The bath of chicken broth, butter and warm spices, like cinnamon, ginger and turmeric, turned these babies into an exotic delicacy that I didn't see possible in an onion. I can olnly imagine how scrumptious they must be with roasted vegetables, winter squashes, stews, rice, pasta, grains, sandwiches, as a side dish to roast chicken, lamb, braised veal shanks, and how they will take mashed potatoes to another level of sophistication. After lunch, we headed back to the kitchen to share a cup of mint tea, talk about life and family and feast on Christine’s Mango tart. We feasted indeed. Just before my last sip of mint tea, I raised, secretly, my cup and made another wish: I wished for this life to always be as sweet and warm as friends and home sweet home are. Put all the ingredients in a saucepan, and cook over a medium-low heat, covered, 1 hour, then remove cover and continues cooking, stirring from time to time, until liquid thickens to a syrupy consistency and the onions have a glazed appearance, about 30 minutes. Serve hot. Mettre tous les ingredients dans une casserole et faire cuire sur feu doux, couvert, pendant 1 heure, puis découvrir et laisser réduire jusqu’a ce que le jus ait la consistence d’un sirop, en remuant de temps en temps, et que les oignons aient une apparence caramélisé, pendant 30 minutes. Servir chaud. Lovely post, and you know the sight of the beautiful couscous (and your lovely tagine in the background) warms my heart. That couscous sounds very special indeed. I wish I could have been there! 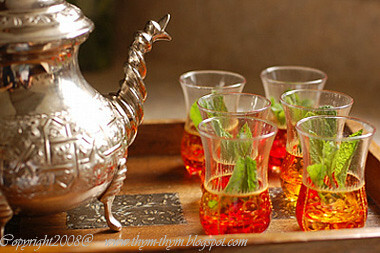 And mint tea - well, that's always a delight for the taste buds. PS The photos are beautiful, that wooden gassaa (does that mean bowl??) is stunning, as is the magnificent teapot....and the tea....and the food....OH MY!!!! - Gigi, thank you very much! Glad you like it. It's lovely, as usual ! 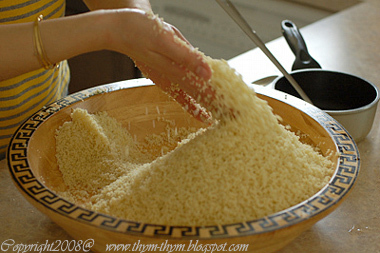 I love couscous, Warda, and I only tried it for the first time a year or so ago! Beautiful photos and beautiful thoughts. Keeping a positive and thankful attitude makes our family a better one. So true, it's all a house and family can wish for. a lovely post warda and the onions sound lovely. i certainly will have to try them out! I love couscous! I like your post a lot... wonderful photoes! Thank you for this post, it was truly touching and your wishes made my eyes well up...fantastic recipe as well. May you always have a happy home and plenty of mint tea! bonjour Warda,j'ai adorais tes recettes et ton blog,quel courage d'ecrire tes recettes en deux langues !! et si j'avais le meme courage aussi !! !